One of the memories of my childhood is spending plenty of hours on my maternal uncle’s farm-house near NCR. He had a factory with lush farm laden with bajra (pearl millet) crop. And we would run amok in those fields. The benefit of having a crop farm in the family is that your pantry is always full of the organic produce. We were never short of bajra in the house and enjoyed it thoroughly during the winter season in form of many dishes including bajre ki kheer and khichdi. After moving to Pune, my connect with lot of those core delicacies and dishes were lost. I was busy finding my footing with 2 kids and a family. This past season, I have made conscious decision to add those healthier and richer options back in our diet – I have already introduced my kids and family to gur ki kheer or jaggery pudding, bajre ki kheer, bathue ka raita, etc. It sounds very desi, core but making it is one of the simplest task you can undertake. Its best cooked with moong dal. Water added is roughly 4 times the total quantity of bajra, rice and dal used. Adding ghee to the bajra khichdi is very important and you must do it. It helps in better digestion of the millet. It is best eaten hot, though you can re-heat and again add ghee before serving. De-husking the bajra is also an important step. It sounds confusing but definitely not when you do it. You may be getting de-husked bajra in your grocery shop, so do check it if this doesn’t work for you. 1. Soak pearl millet or bajra in a wet cloth for 15-20 minutes. Moisture will loosen the husk of millet, making it easy to remove. Give soaked millet a very quick pulse in mixer, you don't want powder, but just enough to separate loosened husk. Remove the pulsed millet into a big platter and blow on them to remove the husk. You may want to be in a area which can be cleaned afterwards or in a garden to absorb all the husk flying. You can do the same step in a mortar and pestle if you have one instead of a mixer. 2. In a pressure cook, heat ghee (clarified butter). When it is hot, add asafoetida and cumin seeds. When the seeds splutter, add turmeirc powder, salt and red chilli powder. Slightly roast them. 3. Now add washed dal, rice and bajra to the cooker and gently roast them for few minutes. Add 4 cups of water and pressure cook for 2-3 whistles. The bajra khichdi is ready. 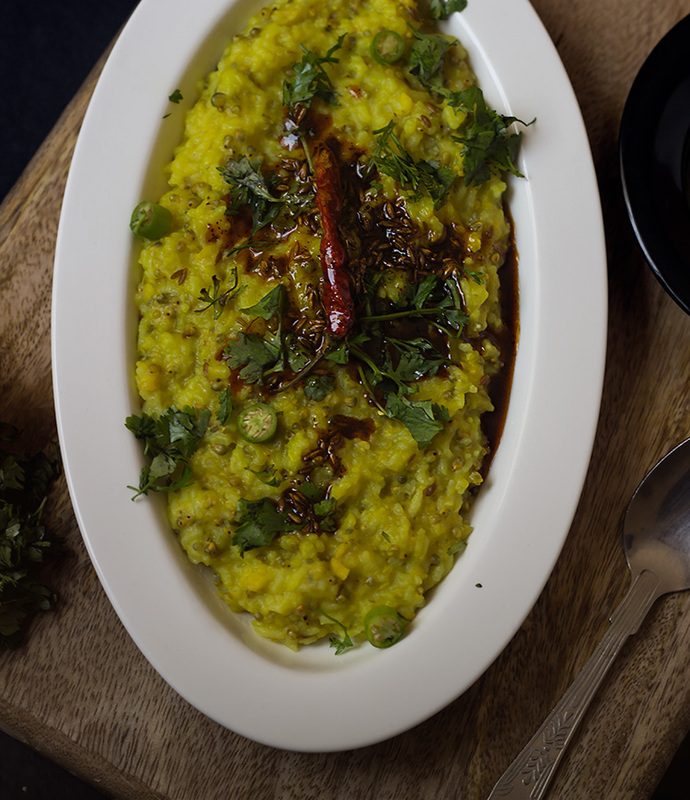 Serve hot with another dollop of ghee and fresh tadka. Adding ghee to the bajra khichdi is very important and you must do it. It helps in better digestion of the millet. It is best eaten hot, though you can re-heat and again add ghee before serving.